Before you get thinking, the word ‘Harami’ does not stand for the word harami used in Hindi 🙂 . Apparently it is old Japanese word for ‘pregnant’. You’d appreciate the intuitiveness of this word, when you see the candlestick formation. Harami is a two candle pattern. The first candle is usually long and the second candle has a small body. The second candle is generally opposite in colour to the first candle. On the appearance of the harami pattern a trend reversal is possible. There are two types of harami patterns – the bullish harami and the bearish harami. As the name suggests, the bullish harami is a bullish pattern appearing at the bottom end of the chart. The bullish harami pattern evolves over a two day period, similar to the engulfing pattern. In the chart below, the bullish harami pattern is encircled. The expectation is that panic amongst the bears will spread in an accelerated manner, giving a greater push to bulls. This tends to push the prices higher. Hence one should look at going long on the stock. The risk taker would initiate the long position at the close of P2 which is around 835. The stop loss for the trade would be lowest low price between P1 and P2; which in this case it is 810. The risk averse will initiate the trade the day near the close of the day after P2, provided it is a blue candle day, which in this case is. Once the trade has been initiated, the trader will have to wait for either the target to be hit or the stop loss to be triggered. 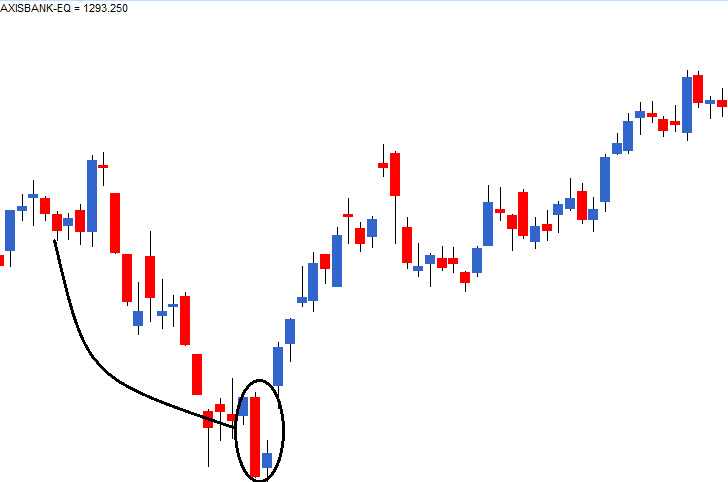 Here is a chart below where the encircled candles depict a bullish harami pattern, but it is not. The prior trend should be bearish, but in this case the prior trend is almost flat which prevents us from classifying this candlestick pattern as a bullish harami. And here is another example where a bullish harami occurred but the stoploss on the trade triggered leading to a loss. The bearish harami pattern appears at the top end of an uptrend which gives the trader a opportunity to initiate a short trade. The expectation is that this negative drift is likely to continue and therefore one should look at setting up a short trade. The highest high between P1 and P2 acts as the stoploss for the trade. The risk taker will initiate the trade on day 2, near the closing price of 125. The risk averse will initiate the trade on the day after P2, only after ensuring it forms a red candle day. In the above example, the risk averse would have avoided the trade completely. The stop loss for the trade would be the highest high between P1 and P2. In this case it would be 129.70. The harami pattern evolves over 2 trading sessions – P1 and P2. The stop loss on a bearish harami pattern is the highest high price between P1 and P2. though i understood engulfing piercing and harami pattern, it would be nice to illustrate the differences amongst them as three are quiet similar. All 3 patterns (Engulfing, Piercing, and Harami) are 2 candlestick patterns. The 2 candles are opposite in colour. In Harami Pattern, the 2nd candle is short an looks contained withing the 1st candle. Then doesn’t it mean that trend reversal is being suggested from candlestick chart perspective whenever 2 days candles are opposite in colour in a trend? Taking scenario of bullish engulfing, peircing pattern and bullish Harami – 2nd day opposite blue candle will be bigger/equal/shorter than 1st day red candle. Yes, it does. As per candlesticks, all the patterns you mentioned indicate trend reversals. two candles of opposite colors doesn’t always mean a reversal. Lets say in a down trend, when P2 opens higher than P1’s close and closes higher than the P1’s open, it doesn’t come under any of the reversal patterns. Yes, agreed. However, along with prior trend and other checklist variable, the probability of a reversal increases. What do we mean by a Sideway trend ? A sideway trend is when the stock gets stuck in a range. I have explained about it here. Is this Hiknasi Candles? & whaT IS TARGET in this type of trade? No, these are candlestick charts. Thank you for the excellent tutorials. When you mention about shorting in these lessons, do you think that the risk averse will get an chance to gain in the cash market as the short positions are closed by the EOD? You cannot short in the cash market for extended period – to short and carry positions you need Futures. Of course you can short cash market on a intra day basis. 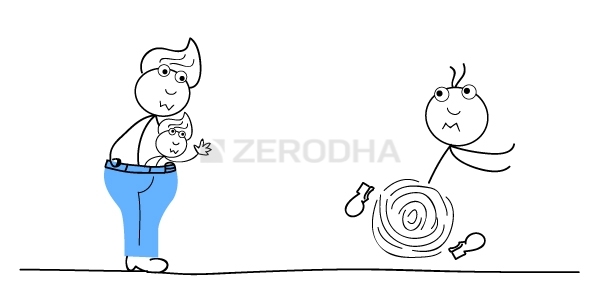 Does Zerodha software provides information on for what stocks the SIngle/Multiple Candlesticks patterns are happening on a day basis? IMO, It is not possible to track all stocks for all the different patterns. I have developed API regarding the same where user will get information on which candlestick pattern it created based on data inputs in OLHC format be it one minute chart, hourly, daily or weekly. If interested ping me on my personal email. dear sir, small correction required in 9.2. ->3, a. The opening on P2 should be higher than the close of P1. Can you confirm the Stop loss & target for the pattern? This can be tricky Vasanth – I guess you are looking at a tick by tick chart where the variation is quite tight. Hence placing the stop can be difficult. I would suggest you look at least 5 minutes chart for intraday, 10 mins is even better. Anyway, the stoploss would be the higher high of the pattern, in this case it would be the upper shadow of the green candle. Kindly clarify the highlighted candle in the chart. Vasanth – It would be difficult to classify it as a bearish harami since there is no prior trend. There has a prior uptrend before classifying a pattern as bearish. In fact I see there is a good bullish marubuzo which suggest you go long on the stock, keeping its low as the stoploss. Probably, but I’m not sure about this as I’ve not traded under such a scenario. Can i consider the highlighted pattern as bullish engulfing? Real body of Green candle(3rd candle) engulfed around 3 times as compare to the Doji(2nd) real body. Yes you can, but I personally would be a bit hesitant to trade on such patterns simply because the volatility seems a bit high, and the stoploss has to be a bit deeper to take up these trades. Has M&M formed a bullish harami pattern on this chart ? It is of 4th februrary. If yes, then should the stoploss be at 1190 ? Yes, this looks like a Bullish Harami pattern. Do check for the volumes and other variables in the checklist before you can initiate the trade. However I must say, I would have been happier to see the bullish green candle to have opened (gap up) slightly higher than what has happened now. Hi Karthik…M&M continued slide after forming bullish harami…suggest what additional variables to check before taking the plunge. Did it satisfy all other variable that we have discussed here in section 18.6 of this chapter (http://zerodha.com/varsity/chapter/dow-theory-part-2/) ? Assuming it did, do note the SL would have triggered the very next day. OK. Will check that. Thanks. Generally you used to say,Look for the prior trend before concluding any pattern.So how many days you want us to take for calculating downtrend or uptrend? The look back period should be at least 5-7 candles to establish prior trend. So if its a EOD chart you are looking at then it means to establish prioor trend you are looking at, at least 5-7 trading sessions to establish prior trend. Thanks for the reply Karthik, Nifty has formed a Inverted hammer on 24-03-2015..So what does that mean? Can we expect it has started upward momentum now? No, in fact if you think about it an inverted hammer has a long upper shadow – this means that the bulls made an attempt to take the market higher, therefore a long upper shadow was formed. However the bulls were not able to sustain the high and eventually the market gave up its gain, this is evident by the fact that the market closed near the low point of the day, thus forming an inverted hammer. Clearly there could be a bit of weakness in the market…however because there is a support at current level market may eventually bounce. These are situations which can be very tricky to trade…hence the need for options. I have spoken about a situation very similar to this in chapter 3 of ‘Options Theory’ module. Suggest you read through it. It will be uploaded in few days. Sir, Has unitech formed a bullish harami pattern on this chart ? It looks like, but the volumes are really low, dont you think so? You are looking for bullish harami pattern and not looking for confirmation if bullish harami gives confirmation than buy call otherwise this is a temporary retracement wait till it gets over and go for sell in this script when any particular sell signals generated. Can this be considered a Bullish Harami (The green candle is also a spinning top and the shadow is not fully contained). In HCL after a long time previous gap was filled today.How to interpret this filling and trade forward? which candle stick pattern i.e Engulfing, Piercing/Dark Cloud and Harima can be considered as strongest. My personal preference is the engulfing pattern. What is the difference between BEARISH HARAMI and BEARISH HARAMI CROSS? Bearish Harami = White candle followed by a small red candle contained within. Bearish Harami = White candle followed by a doji contained within. so that means, in a bearish Harami Cross….instead of a small red candle after the white candle in an uptrend, there is a dogi…right? Hi Karhik, is this a failed Bullish harami ? The primary trend is down and the bullish harami was formed at substantial support with volumes. The RSI too is oversold. The secondary trend is up though. how does one read the secondary trend in such cases? Do you think the bearish candle today was a retracement as the volumes relatively low and can we go long from here? Hence I would be a bit cautions although my bias would be towards a buy …also due to the fact that the stock has formed a double bottom and since support is there near the current market price. Primary trend,Secondary trend,double bottom terms are new to me as far as i have read. can u explain me dis terms. I’ve explined the same in the Dow theory chapters. Thanks for those observations. are you suggesting that as the volumes were constantly dipping as the price moved up should have been a sign of caution? i have marked a blue line on the volume panel for the same. also, the day the bullish harami was formed the volumes were lesser compared to the days the price retraced upwards. should that have been noted too? Absolutely. Declining volume with increase in price, especially after a bout of selling should be treated with caution. Options is the best instrument of choice if one were to trade these setups. Also, how does one trade a spinning top or a doji at support or resistance? do we wait for a recognizable candle post them to place trades? Yes, it makes sense for a pattern to emerge. But the bias is towards a reversal. Think about it – if there is a support the chances are that the demand could emerge. Add to this a doji – by definition a doji is supposed to show indecision, which means the sellers strength is now questionable. Hence from both the angles its justified to build a bias towards a reversal. Adaniports chart from 1st Jan 2015 attached. 1) Candle No. 2 is a doji… can candle no. 1 & 2 be considered as a BULLISH HARAMI CROSS ? 2) Can candle No. 2 & 3 be considered as a BEARISH ENGULFING PATTERN ? 3) Can candle no. 3 be considered as a HAMMER? Candle 2 is a doji. 1&2 and 2&3 are not valid Bullish Harami Cross and Bearish Engulfing patters as there is a lack of convincing prior trend. Candle 3 is a hammer. Karthik, why do you call Candle 3 a hammer? – is it only because of its form (it seems to be occurring during a sideways trend)? A paper umbrella is called a Hammer only if it occurs at the end of a downtrend. Else its just a paper umbrella with no significance. sir in we go short(CNC).. is there a limitation that we have to square off within some stipulated time?? Many thanks for putting together this great material! I have been following Bharti Airtel for the past week and it seems to be at a very very interesting position. I am bearish on it due to the following reasons and i’d be happy if you could provide your insights. 2/ Last high was made @435 at a very high volume of ~68m. On the day, stock closed ~10 bucks lower from the high (losing ~30% of the day’s gains). Despite the volume shocker, prices could not go higher. 3/ A week of dojis and spinning tops after the long candle day. Bullish uncertainty? or are they consolidating?? 4/ Last two candles are dropping. Bulls haven’t given up yet though – low of the long candle of 29th @ 403 hasn’t been breached yet (bears did test it though!). 5/ On the verge of an MACD crossover? 9 day EMA is still above the 26 day EMA though! 6/ Finally, is there a bearish harami?! Seems perfect! Except for the last point on bearish Harami everything else makes sense. However it make take sometime to crack especially if the markets starts to go up from here. Hence I’d be happy to buy a Put option here. Good luck. Karthik, using the flexibility rule can we treat the formation indicated by the green arrow as a bullish harami? i ask as the close of previous black candle after a sustained downtrend was at 574.35 and the opening of the BH candle was at 574.10. also, i am using a 14 day volume MA as opposed to a 10 day volume MA. what are your views. You certainly can Madhu, although a higher open (say 576 or 578) would have been preferable. 14 day MA is just fine. No problem with that. is this bearish Engulfing with doji? and bearsih harami after that? can we sell at this level? as RSI is also showing overbought. Need to see the chart 🙂 Btw, why are you not able to upload the chart? It seems to be working fine here..
could you please try to upload image on this page? 1. When should be trade in equity, futures and options? 3. Since then I have been trading in options (cnx Nifty) and been earning decent enough returns based on news (related to bank rate cut, if nifty rises continuously for 2 days then high chances of falling the 3rd day etc. 1) I know this may sound like a boring advice, but start ‘trading’ only when you develop a trading strategy. Until then try and invest your money and experience how wealth is generated over long term. 2) As a beginner you should avoid both futures and options…at least till a stage where you are comfortable understanding how these work. Trade them only when you fully understand how to deal their risk reward characteristics. 3) Try and develop this into a proper strategy so that you can back test this and understand its behavior patterns. i am tracking the IDBI stock for couple of weeks and enjoyed a near about 50% surplus in just 8-10 days. Good to hear this Ankit…but cant see the image. Can i expect last candle as a Doji? I am in Dilema, Before last candle It has fomed Bullish harami right? Bullish harami yes, but not really a doji. Is it the bullish harmi pattern formed in the following chart ? Yes, it certainly looks so. Part of the game Abhijeet..you just have to keep improvising. just started trading past15 days, can you advise me to find a coaching classes in personal, i am from Chennai. trying to study your candlestick all parts, understanding well but i can not recall it, please give me your valuable advice. Not sure about other places…I would sincerely suggest you stick to the contents in Varsity and practice regularly. Thanks for your advice, please let me know how to keep remember the candlestick patern in mind. If there’s any practical training. I would suggest you pick up one pattern and trade that for a while till you get accustomed to it. For example you could choose to trade only Marubuzo for 3 months..end of 3 months you would be perfect in marubuzo and hence move the next pattern. I WANTED TO ASK YOU AFTER GOING THROUGH THE CHAPTERS ON BULLISH ENGULFING, BULLISH PIERCING AND BULLISH HARAMI PATTERNS IT BASICALLY MEANS THAT WHENEVER YOU ARE IN A DOWNTREND AND IF YOU SEE EVEN ONE GREEN CANDLE DAY YOU SHOULD BUY? SO WHEN SHOULD WE NOT BUY SEEING A GREEN P2 CANDLE? Yes, whenever you see a bullish pattern in a downtrend, you should look for buying opportunities. Its best if you buy it towards the close of P2, maybe around 3:15 PM. Hi karthik, in the harami method how to establish the pattern? only by observation,visualizing and interpretation? if the p2 is lower part than the middle can it be called harami? A simple visual sniff test helps. The body of P2 should be within the P1 and preferably the shadows too. I’d give the engulfing of body more importance over the shadows. Would you include your valuable knowledge s on chart patterns like head and shoulders, double top and bottom in varsity site. There is already a chapter on Double top/bottom. Suggest you check the Dow Theory chapter. I think it should be closing price of P2 should be greater than the open of P1 ? would you kindly clarify. George, thanks for pointing this. Will make the necessary corrections. PDFs and iBooks are already made available and you can freely download the same from the module page. Is it safe to replace the word “day” with week in your examples of Haramai pattern.I believe the behaviour and expectation remains the same irrespective of day charts or weekly charts.Also i could see a bullish Harami kind of pattern on weekly charts of asian paints(21-11-16).It had a prior downtrend that started 4 weeks before exactly.Can we go long with this pattern now? Yes, you certainly can. In fact TA works across all time frames. You have the flexibility the apply to apply TA on minute, hourly, daily, weekly, or even monthly chart. Does colour of the P1 candle really matter? As I came across a scenario similar to a bearish harami where both P1 and P2 being red in an uptrend. for TA futures contract, whether to look at underlying scrip chart or scrip future chart? Bcz if it is the first day of contract then to do TA on it? Does upper and lower shadow matter while forming bullish or bearish harami? I’d prefer looking at the real body. So, according to you, if i am not wrong, the harami pattern formed when the traders got traped and forced to sell or buy there stocks in the loss result in reversal of the stock. Am i right? If not, can you please explain. Yup, traders also refer to this as short covering. Candlestick patterns is all about price action and the ensuing actions that you can take. Hi there, so after a span of 1 month I’ve seen several stocks with interval of 10 or 15 minute candles. Firstly, the frequency of pattern formation with proper prior trend is pretty low in 10 or 15 min candle interval. So by all that mentioned above, the possibility of earning any money in intraday interval of 10 or 15 min candle via patterns is almost nothing.. Could you please advice me what should be done ? Patterns seems to work the best imo in EOD basis only. 2) If this is true, then maybe you should change the duration and check for other timeframes. Never force fit a pattern. What if offer price(quantity) is 00(0) trade will occur or not??? Yes, no trades would occur. yesterday, nifty 50 formed bullish harami pattern, is it true that when such a pattern occurred during an uptrend, it is considered as bearish signal and it clearly implies that the market will continue the corrective tendency for sometime and no runaway rise is likely. Yes, the probability is high, but as I said there are no guarantees in the market. Hi Sir, on 12th May Gail has formed a bearish pregnant pattern. also it looks to have formed a hammer pattern at 3.20 pm but on close because of the averaging of last 30 minutes, it closed below with a long upper shadow. can we apply exception here and treat it as bull with a SL of 400. Please share your thoughts. Thank you. No, it does not sound too convincing for me. You may want to look at the chart on a EOD basis. what is mat hold pattern and how to analyse it and use it for the price behaviour ? mat hold pattern? Sorry, I’m not too sure about this. is it true that in a bearish harami or bullish harami pattern, the smaller the second candlestick, the more likely the reversal. It is thought to be a strong sign that a trend is ending when a large candle is followed by a small candle. Not sure, I’ve never come across such a theory. can you explain why in the IDFC Limited example , the risk averse trader avoided the trade? Guess because of the colour of the candle on P3. Yes, they can be. I’d suggest you start with this module itself. First of all, great job compiling these materials and explaining on simple language for a layman like me. I happen to notice that in any of the charts, you have not shown the timeline in X axis. Are these for intraday? Also in the beginning it was mentioned that TA is for short term trades. You also suggest to vaise the trend referral around 3:20 pm of P2 day. So are we placing orders for few days? But isn’t our order valid GFD. If yes, then are we taking delivery of the shares? In case of short, don’t we have to close of our position the same day otherwise it will get auctioned that should be avoided? I’m quite confused. Pls explain. Shreesh, I guess I must have chopped off x axis for space constraints :)….honestly, dont know why I did that. If a trade is taken at 3:20, then naturally we are talking about carrying forward the trade. You can do this via futures or an options position….this holds true for short positions as well. Remember, short positions in spot has to be closed within the same day, not futures and options. I have been reading these candlestick patterns since past few days. However, whenever you mention that Risk taker would initiate trade around 3:20 pm at the end of the day, I find it very difficult to understand. (1) why would someone initiate trade around 3:20 pm, given that there are only few minutes left to execute the trade on the same day( 3:20 pm to 3:30 pm)? here I am assuming that its intraday trading. (2) or is it like buying today around 3:20 pm and selling next day? I am novice to trading as its apparent from questions ! How do I maintain a stop loss for a period of over a day? Is there a greater than day type of order in Zerodha where I can put a stop loss order for more than a day and leave it there? If yes, what is it called and how do I initiate one? You will have to place it every day. Unfortunately, that feature is not available. Thanks Karthik. The best part of these lessons are you prompt replies even after years of writing the article. Don’t you think a feature like GTD that we have in our competitors be a good idea to be implemented in the Zerodha Kite Platform too? Would you be willing to take this as a feedback and bring it to the attention of your leadership? There are technical and regulatory challenges around this, Ash. That’s the reason why we don’t have this, else this would have been in place long ago. Oh, but talking about regulatory challenges, how did Sharekhan get over it then. Not sure If I can mention a competitors name here, please delete the post if I couldn’t. I see that option in their trading platform. About Sharekhan, let me check. Thanks. Should both the candles P1 and P2 in a Harami pattern satisfy the volume condition in checklist. Also in general for multiple candlestick patterns should all the candles involved in pattern formation should have at least avg vol traded. Ideally yes – for both. Both the piercing pattern and bullish harami seem the same, what’s the difference between them? The difference is in the positioning of the 2nd day;s candle. I’ve been going through the chapter. My question is that if one does identify any particular multiple candlestick pattern for eg, a bearish harami, what is the levels that they should be looking to square off the position created on that chart view. Till chapter 8 i have derived where the possible stop loss for a trade is based on the information but there is no mention of prospective targets or how does one go about ascertaining that? I’d suggest you read the chapter on support and resistance. This will give you a perspective on how to place targets and even stoploss orders. Thanks for providing such awesome material. Rushabh, a trading session simply refers to the daily market opening and closing.For example on Monday, the market opens at 9:15 AM and closes at 3:30 PM, this would be a considered as a trading session. Yes, you can use candlestick patterns for intraday trading. Hi Karthik, please address a few doubts of mine, Thank You. 1. What if, multiple and opposite patterns are observed in simultaneous candles? For example, if there is an uptrend in the stock and then then a bearish candle is observed (forming a Bearish Harami Pattern), but right after it a bullish candle engulfs the previously made bearish candle. What do we infer out of such a pattern? 2. While observing the intraday charts, sometimes contradicting observations occur for different time frames, for example, a buying opportunity in the 5 minute chart wheres as the 15 minute chart shows a prolonging down trend. What do we take into consideration when such crossovers take place? What should be an ideal number of points to set as the target in intraday trading since on several occasions the S&R calculated is way too high or low? 1) Possible to get stuck in such situations, hence the basic rules – buy on a blue candle day and sell on a red candle day. 2) Possible. For this reason, you need to stick to one-time frame and trade that. Also remember, longer the time frame, better is the quality of information. I’d prefer 15 for intraday trading. Thank You. Also, if you could please suggest an ideal number of points as target for an intraday trade? How many data points (number of days) should we take into consideration to determine whether it is a upward trend or a downward trend in case of intra day share trading? If you are looking at intraday or swing trading, then you need to look at at least 5-8 trading sessions. For longer-term trades, look at at least 15 days of data. Hi by the way what determines the opening price of the stock. The pre opening session? Or the very first trade after the market opens that day? It really depends on the demand and supply for the stock on the given morning. Sir are there any indicators similar to demand zone and supply zone on kite 3.0? Firstly,thanks a lot for providing an exceptionally good platform for learning! I have a small doubt. Regarding all the candle stick patterns mentioned in this module which time frame would it best apply to? And what’s your suggestion sir? My personal preference is EOD charts, Daniel. all these chart pattern are valid for positional or swing trading right ? Can we use above candle sticks charts for buying and selling opportunities in Futures as well ? and also what time frame should we choose to observe trend? Yes, you certainly can. If you are into swing trades, look for at least EOD charts. For intraday, look for 10 or 15 mins. What is the timeline taken for the trends to form these patterns. In fact for all the patterns like engulf,haraami etc. Usually, its best if these patterns occur after 8-12 trading sessions of showcasing a trend. Yes, that is a bullish harami and like I have said earlier – there are no guarantees in the market. CS patterns only enhance your probability of success. Yes this is a piercing pattern. Chirag, I always pay more attention to the candlestick patterns over the indicators. But then this is just my comfort level while trading. You need to discover your comfort for a better trading experience. so for these case what will u do?by seeing that chart? Well, you cannot have a target based on resistance for stocks at ATH. The only option is to trail the profits. so should i trade nextday at time of 0320pm or inthe next day at the start of morning? Depends on your risk appetite. Some traders prefer to play it safe and trade at the close, some prefer to trade at the open. I’d suggest you take it on a case to case basis. Hi karthik , what if I keep my stoploss equal to the price that I have bought the shares in case of going long? Wouldnt that reduce my losses in case the pattern reverses? Yes, you can place it there….and by doing so, you will neither have a profit or a loss (assuming the SL triggers). Thanks for simplifying the concepts!! In case of Bullish Harami, what happens if P2’s closing price is > P1’s Open price?? Will that indicate a buy for a risk taker?? (or may be answer to my question is yes but the candle stick pattern would better be named as Piercing Pattern)? That would kind of invalidate the harami pattern. The whole idea here is that P2 is contained within P1, there is a sudden shock for the bears here. The price is likely to increase only if this shock translates to panic and shorts starts covering up their positions. In case, the close of P2 is higher than P1’s opening, I’m afraid there won’t be much panic. The material prepared by you is quite omniscient and gives a holistic view of the markets. I really did find it enlightening. 2.) Does keeping a daily target of overall profit/loss count as a fair strategy for rookie players ?? 2) Don’t do that. It will lead to stress and you cannot trade (take a rational decision based) when under stress. CS pattern does not inherently give you targets, like the way it does give SL. You can use techniques of Support and Resistance for placing relevant SLs or even consider trailing your SLs. Both techniques are explained later on. Hi Karthik, in all these examples, a person has to carry over his position to another day. How is it possible in intraday trade? Also, if it’s CNC, we can only do BTST, or wait for the shares to be delivered(+another day+more STT); what if the trend reverses within this time period, how should we buy/short our positions then?? Kindly help me understand. Think about this – you notice a bullish engulfing pattern at around 3:20PM. The default trade is to go long on futures and carry forward the position. However, assume you are not comfortable with overnight risk. So you don’t initiate this trade. Next day, you want to trade this stock? Will you go short? No right? You would want to be buyer in the stock at every possible dip. What I’m suggesting is that you can use these patterns for intraday as well. The biggest challenge while placing intraday trades is to figure out if you are a buyer or a seller…this is where these patterns will help. Thanks a lot Karthik for the response. So I understand that the time period of a day can be replaced by 30, 15, 10 or 5 min in each of the examples, i.e., the effect of the patterns will be same in these time periods as well. I hope the understanding is correct?? Yes, you can change the frequency, the patterns and its implication will be the same. I have seen in so many instance where the markets makes high and on P2 opening will again be higher and hits the day high as same as in bearish pattern case also. In these cases the harami does not apply right? As long as the real body is within the previous day candle, one can consider it as a Harami pattern. Why there is a distinction created between the two patterns ( harami and engulfing)? E.g. if we look from broader perspective, both bullish patterns i.e bullish harami and bulish engulfing, are preceded by downtrend, followed by red and blue color candles, respectively. Only thing that differentiate these two patterns is the size of candles. Hence if generalised , in any case at the bottom of a downtrend if one finds two candles one red and other blue respectively, the Patten shows trend reversal. And exactly opposite for bearish patterns. Manish, the open and close in both cases are different. This difference leads to change in sentiment. In the above lesson, there is a minor printing mistake in the below statement. “Here is a chart of IDFC Limited where the bearish engulfing pattern is”. Instead of “bearish engulfing”, it should be “bearish harami”. Ah, let me look at this. Thanks for pointing out. In general, why is it important for the P2 candle to be as small as possible compared to the P1 candle(colour notwithstanding). Let’s take a Bullish Harami, I understand about the open of the P2 candle being above the close of the P1and thus indicating bullish sentiment, but wouldn’t it be a stronger signal, if the close of P2 was above the open of P1? All candlestick patterns should be looked upon by the perspective of buyers and sellers. A small candle casts a doubt in the minds of the bears (who are otherwise in control). A slight move up on P3 will convert this doubt to panic, which leads to a short covering rally, which is exactly what you need as a buyer. I have tried to identify instances of Bullish and Bearish Harami in the IDEA chart here. Could you please take a look, and share your thoughts on them. I think I’d consider 5,9,11 as a good example of the pattern. Ideally, P2 should be contained halfway through P1. Will keep that in mind while spotting the next time. Doe this mean the risk averse will have to initiate the trade during closing time around 3.20 PM on the next day after P2? or its nearer the close price of P2 on the next day? Nearer to the close price of P2, the next day. Apurva, like I have explained, CS patterns only enhance your probability of success. There are no guarantees here. Hi Karthik, I really like the way you explain which has also enhanced my interest towards candle stick. Arun, the best part of candlesticks patterns is that it comes with inbuilt risk management mechanisms (SL). However, it does not gives you insights into placing targets. For this, I think simple techniques like support and resistance helps. Many thanks for such wonderful information. Can you please help me understand the below points? 1) While considering bullish or bearish trend, what’s the typical timeframe/duration to be considered for assuming the trend? Is it 6 months? 2) How to take a short position for a shorter term trader? Is it to be taken in derivatives? 2) Ideally yes, but no harm initiating short-term equity trades. I failed to get the point on Axis bank of 1st Oct trading results with previous days candle stick pattern. Murali, which part are you getting stuck with? Will be happy to explain. Shouldnt the opening price of a stock on a given day be equal to the closing price of the stock on the previous day?? No, the pattern (bullish harami) suggests that the opening on P2 is above the close of P1. Which is more reliable/strong among three(Engulfing/Piercing/Harami) candle stick pattern? I think Engulfing is most reliable for reversal….what do you think? I like both Engulfing and harami patterns. I’m not a big fan of the piercing pattern. Sir..You Are Really Doing A Great Work..It is Really Very Very Helpful..
Of course, you can, Rishabh. Look specifically for Marubuzo patterns here. Yes, specifically in sideways markets. 2. If I need to wait for more than 2 patterns to be formed wouldn’t I missing the opportunity to trade for that day as I might not even get a similar pattern after that . 3. If two formations are enough for me to do a quick shorting then what is the time gap between these patterns should be or it doesn’t really matter. 4. Similar above mentioned questions for Hammer or hanging man pattern as well. Sir can we consider this as bullish harami pattern with good volumes and price around support and go long here but macd is below signal line what would be your opinion in this type of trades. Unable to open the link, Srinath. You can check it now sir it’s opening. Sir can we consider the pattern formed in m&m as bullish harami with good volumes and price around support and go long here but macd is below signal line what would be your opinion in this kind of trades. Here is the link sir. Just a small query, if after forming the pattern, the stock does not jump immediately but forms another bearish candle the next day, however the stoploss does not get triggered, does the pattern yet remain valid or is that considered the failure point? Bearish pattern (except for marubuzo) will not matter. Remember for a bearish pattern we need the prior trend to be upwards. Whether all these analysis apply to intraday trading as well? I mean, if the candles are 15 min candles can i use the same analysis? Yes, the candlestick pattern can be applied to any asset (equity spot, eq futures, commodities, currencies) across any timeframe (5mins, 10 mins, 15 mins, EOC etc). Why will the bears panic if day 2 opening price is more than day 1 closing price? The losses would mount for the bears, Diganta, hence they would panic. Would like to validate my understanding. Prior trend: Downtrend – (From feb 8th it has come down, though last few sessions have been flat). Yes, it has formed a Bullish Harami. However, I think 7200 is a more reasonable target. I thought as per the charts the resistance level should be 7300 – are we choosing 7200, to be on the safer side or is there any other reason, that I am missing? Plotting S&R is a very visual concept and may differ from person to person (but not by a huge margin). I thought 7200 had a fair amount of price action. Why don’t you recheck once? For a piercing pattern, is P2’s opening being lesser than P1’s closing, a necessary condition? If no, a Harami pattern that covers more than 50% of P1, could that also be interpreted as Piercing? It should be lesser than P1’s close or at the most equal to it.